A film that takes a unique insight into what makes a soldier tick - how does one deal with a lifetime of killing? Uri Gil is a Guinness World Record holder. 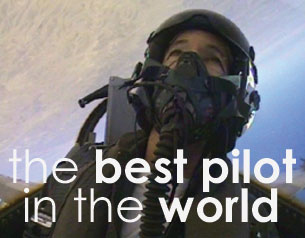 At 61 he's the oldest active fighter pilot and he's waged battle in the skies for decades as he's pressed home Israel's military agenda. A passionate painter as well as a soldier, Uri talks with surprising candour about his values and life in the Air Force. We gain a unique insight into what makes a soldier tick - how does one deal with a lifetime of killing? Uri was flying over the Suez Canal in 1973 when a missile whizzed past him: 'If I'd broken a fraction of a second later, I wouldn't be here today.' The archive footage this film uncovers is powerful, bringing to life the experiences we explore with Uri. 'Flight is a serious vocation, it takes up all of you'. The danger of his missions never dampened his passion for flying or his willingness to fight: 'There's a remoteness from the terror you're creating. You're discharging bombs with great powers of destruction and this is something terrible. While produced without partiality there's a quiet understatement to the way any experienced soldier must come to justify himself. It is also beautiful. There's beauty in this power.' Uri has clearly been forged by his career 'You see everything as a target'. Over his 41 years of service in the Israeli Air Force, Uri downed many enemy planes and he can't hide the pride he feels: 'I'm the only pilot who downed planes in all the wars. Two of them hit the cockpit.' Yet Uri claims to have never gloated: 'I was never happy afterwards. I like to show the enemy some respect. ' Battle-hardened, he admits to 'flourishing in wars.' For him, the key character components of any good soldier are an ability to adapt and an understanding of sacrifice. Time has come for his last flight. After a last round over the base, Uri leaves the plane with tears in his eyes. Surely this man has never cried before.